I have been busy knitting a cardigan, Lourdes, from Rowan Knitting & Crochet Magazine 55, a design by Vibe Ulrik using the beautiful yarn Panama, a blend of viscose, cotton and linen. Lourdes has a lace and stocking stitch striped pattern with a round neck and yoke. It’s been on my list for a while now but I decided it was now or never as this yarn, and one of my favourites, has sadly been discontinued. 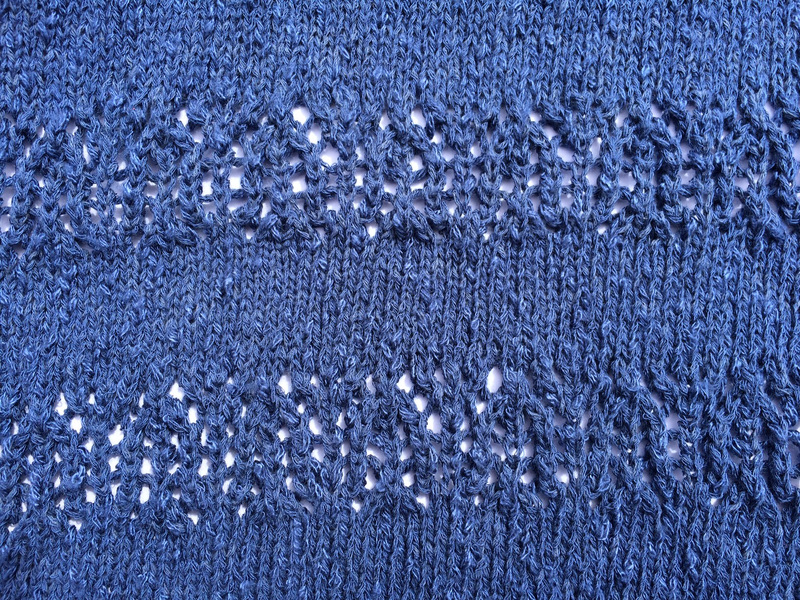 Below is a close-up of the lace stripe design in the dark blue shade called Lotus that I’ve chosen for my cardigan. This design is meant to be for an experienced knitter and that may well be true because of the lace pattern and the fact that you knit the body of the cardigan in one to the underarms and then join in the two sleeves and continue with the yoke. 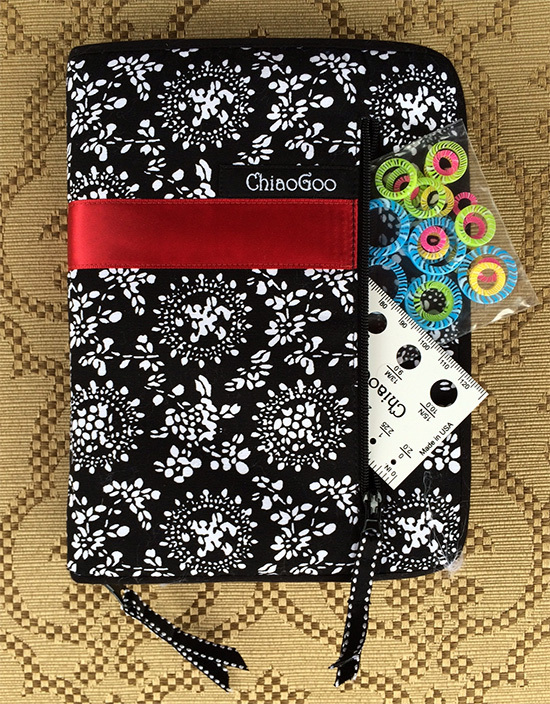 For this you will need to use circular knitting needles so it does help to have a great set of knitting needles such as ChiaoGoo Twist Red Lace Interchangeable Knitting Needles……. You can see some things are missing because they are in use on this project and two other projects……. • 3 cable lengths: 14″, 22″ and 30” for the smaller needle tips and 3 for the larger needle tips. 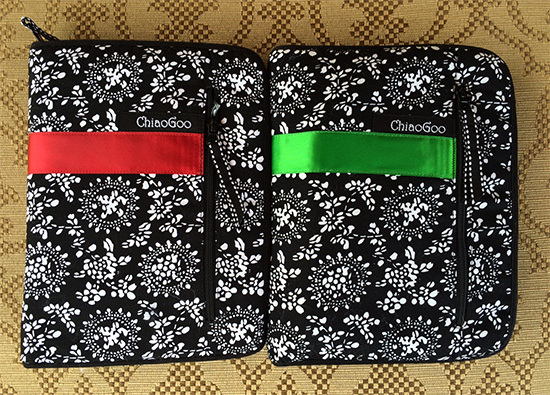 • compact soft fabric carry case with zipper plus a pocket on the outside large enough to hold a few accessories. 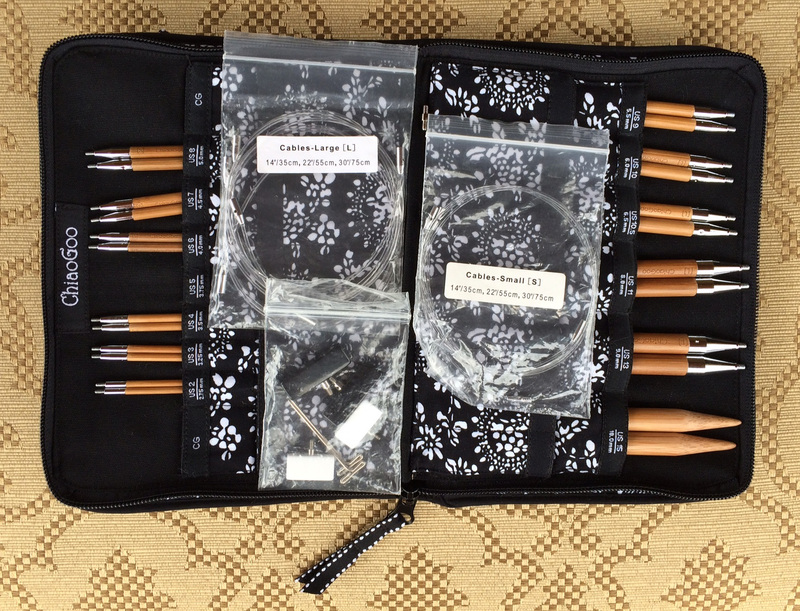 I put these on my wish list because the year before, after much research, I bought a similar set but with bamboo needle tips called the ChiaoGoo Spin Interchangeable Knitting Needles. Again, some items are busy on other projects……….. They contain the same number of needle tips, etc, but with flexible clear nylon cables in 3 cable lengths of 8″ (20 cm), 14″ (35 cm), and 22″ (55 cm) for the small needle tips and 3 for the larger ones. I like to use bamboo needles when I knit with very slippery or delicate yarns such as Rowan Kidsilk Haze as the yarn is less likely to slip off the needle; the bamboo allows the yarn to grip the needle slightly. 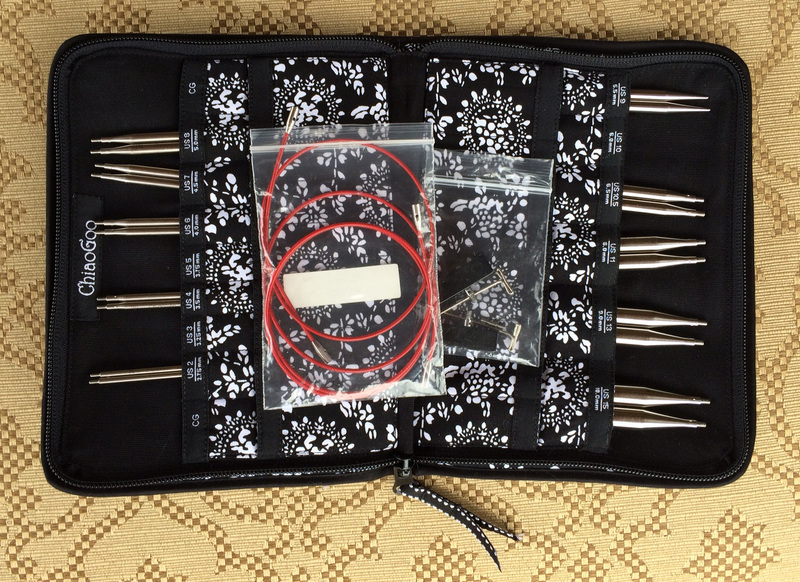 Both the stainless steel and bamboo needles have distinct tips with the stainless steel ones having a slightly longer tip than the bamboo making them perfect for lace knitting. However, this longer tip means that you must push the needle right through when making each new stitch so that the stitch is formed on the actual body of the needle. If you form the stitch on the needle tip you may find you finish with an irregular gauge. I am an English knitter and push the needle through the stitch on the left hand needle quite a long way; I’m not sure how well these longer needle tips would work with continental style knitters who pick the yarn through with the tip of the needle? Even so, with both needle types the well-defined tips are great for working tricky decreases such as K2tog tbl, etc. I find that neither are too pointy meaning that they won’t make your finger sore if you knit like me and continually push the tip of the needle down with your index finger every time you make a new stitch. 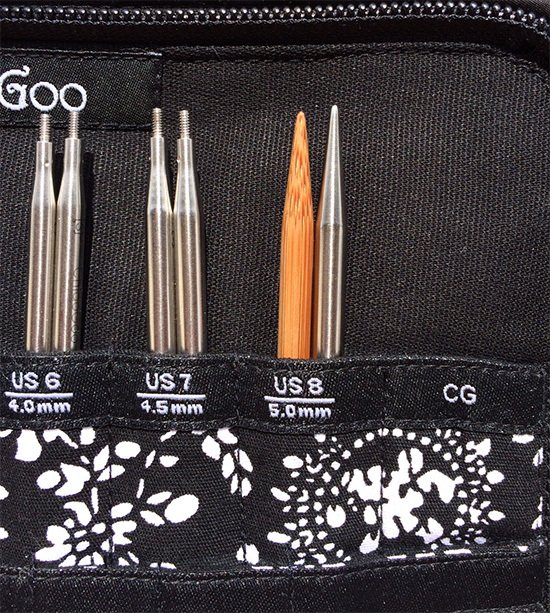 These ChiaoGoo knitting needle sets are of excellent quality. The joins between the needle tip and cable ends are very smooth and do not snag your yarn as you move the stitches along. The cables spin around which prevent them twisting and tangling and they stay locked tight if you use the T-shaped cord tightening keys. Also, the cables are interchangeable between both sets, which is very useful, and they are flexible enough to use for magic loop knitting. 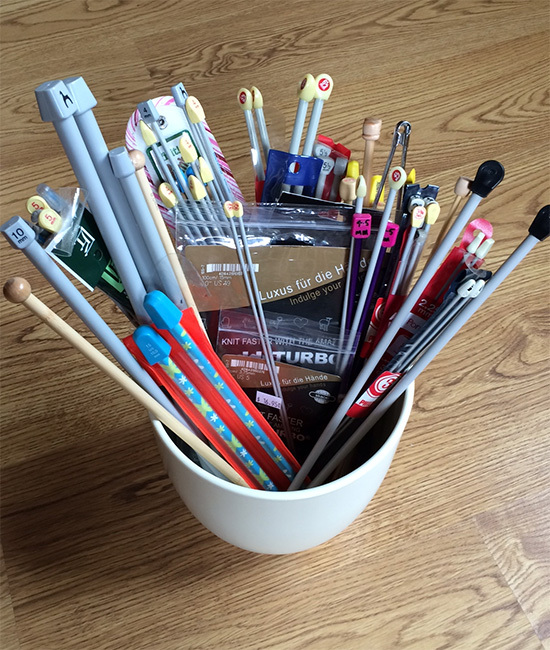 So, when I go away on my travels and I’m not sure what needle sizes I will need instead of taking all of these……………. 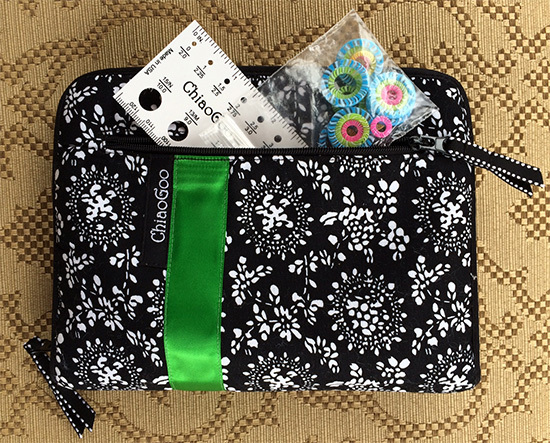 It’s great having all the sizes and lengths I could possibly want in one little case! I haven’t quite finished my Loudres cardigan yet but you can see why circular knitting needles are really useful! 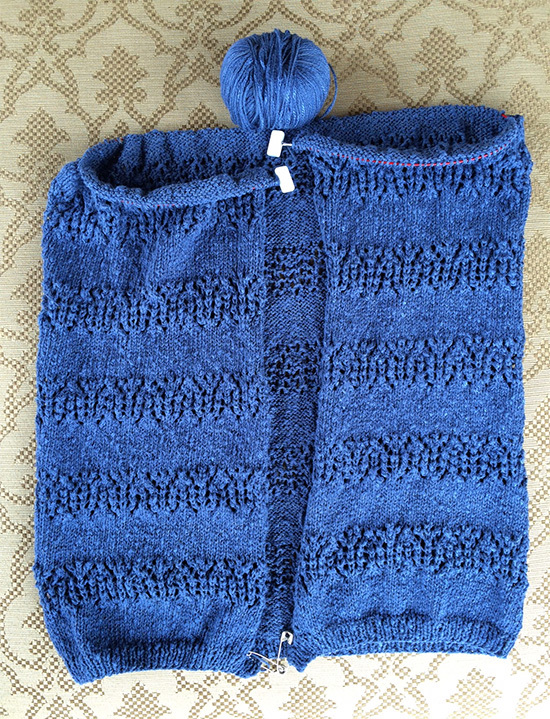 Finished photo of cardigan coming soon! If you have any questions or comments do let me know by leaving a reply below or scroll to the top and click on the little speech bubble!